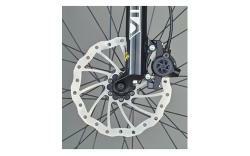 The Magura brake system works as an open system with a twin-piston caliper and has the benefit of automatic pad wear adjustment. As its a low-pressure design it works in a similar way to Maguras hydraulic rim brakes making the brake slight cheaper to manufacture but still acheiving the same great performance. The system can come with 180mm front and 160mm rear rotors, IS and PM mounting. To improve cooling, drilled SL rotor.